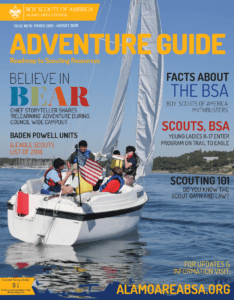 The Alamo Area Council, BSA headquartered in San Antonio, Texas, serves a 13 county area imparting the Scouting program to over 18,000 youth and 5,000 volunteer adults in South Texas. 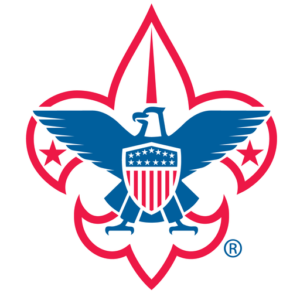 The Boy Scouts of America continue to prepare young people for life by providing the nation’s foremost youth program of character development and values-based leadership training, utilizing outdoor activity, citizenship, and sports fitness. The Alamo Area Council manages over 1,280 acres of outdoor adventure for boys and girls from 5-20 years of age at three premier camps – Bear Creek Scout Reservation, Mays Family Scout Ranch, and McGimsey Scout Park. Learn more at www.AlamoAreaBSA.org. El Alamo Area Council, BSA, basado en San Antonio, Tejas, sirve a 13 condados del área, imparta el programa de aventura a más de 18.000 jóvenes y 5.000 adultos voluntarios en el sur de Tejas. Los Boy Scouts of America seguirán preparando a los jóvenes para la vida, presentando el programa nacional más importante del desarrollo del carácter y los valores de la formación basada en el liderazco utilizado en las actividades al aire libre, la ciudadanía, y la aptitud deportiva. The counties served by the Alamo Area BSA include Bexar, Atascosa, Bandera, Comal, Frio, Guadalupe, Karnes, Kendall, Kerr, La Salle, McMullen, Medina, and Wilson. “Do a Good Turn Daily”- which means to do a special act of kindness, big or small, every day.